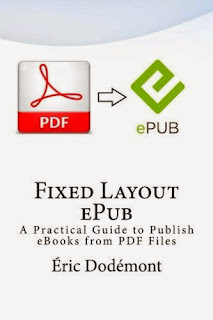 I just have updated my book about fixed layout ePub. Old title: A Practical Guide to Convert a PDF File to an ePub Version 3 Fixed Layout File (May 2014 - No ISBN). New title: Fixed Layout ePub: A Practical Guide to Publish eBooks from PDF Files (November 2014 - ISBN: 978-1502809506). Buy paper version on Amazon. Buy electronic version on Google Play Books.